The position and shape of the eyebrows are the keystone to our facial expression. If slanted downward we look angry, if tilted back we look sad or worried. 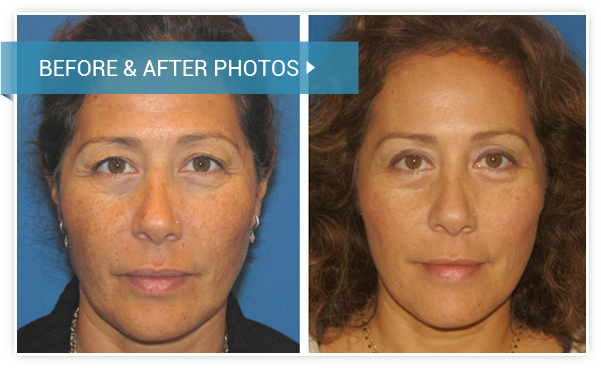 The goal of a browlift, or forehead lift, is to reestablish the correct position of the brows to give a natural look. This will open up the eyes and give a pleasant, rested appearance to the entire face as well as a smoother forehead. There are three techniques that can be used. The coronal browlift involves an incision back in the hairline. A pretrichal browlift is used in patients with high foreheads. The incision is placed at the hairline centrally and then extends into the hair bearing areas. This will lower the hairline. The endoscopic, or minimally invasive, browlift involves three smaller incisions in the hair bearing areas with the aid of a camera. The browlift, or forehead lift procedure is an outpatient surgery performed under general anesthesia and takes between one and two hours. You will have some swelling and bruising but this will subside over the first two weeks. You may also have some discomfort similar to a headache post surgery which will be relieved with pain medication.